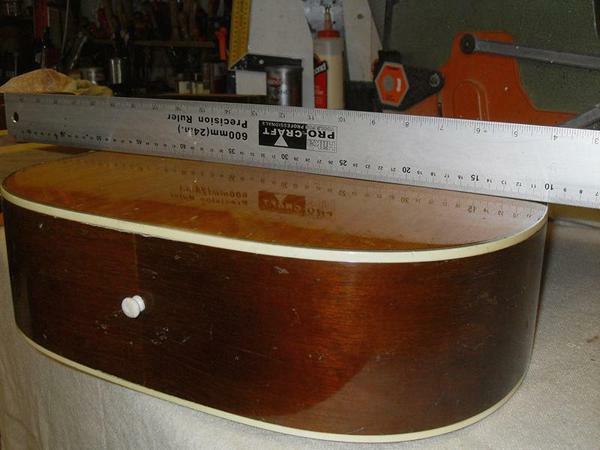 harmony collector UK : My method of curing the problem is very simple and has only failed to work properly on one guitar, a '64 Epiphone Caballero that had the thickest top I've ever seen on any guitar. Many years ago, I was in the boat building business and learned how heat and moisture could make wood do things it would rather not do. So, I made a simple clamp from oak with jaws wide and deep enough to take a big guitar body and used steam directed into the guitar from a pressure cooker (I now use an old coffee maker) to persuade the wood back into it's original shape. The bottom jaw of the clamp has a concave profile to allow for the curved back of a flat top guitar and the top one is slightly convex to bear onto middle of the bulge. Successive steaming and tightening of the clamp has the effect of reducing or completely eliminating the bulge over a couple of days. 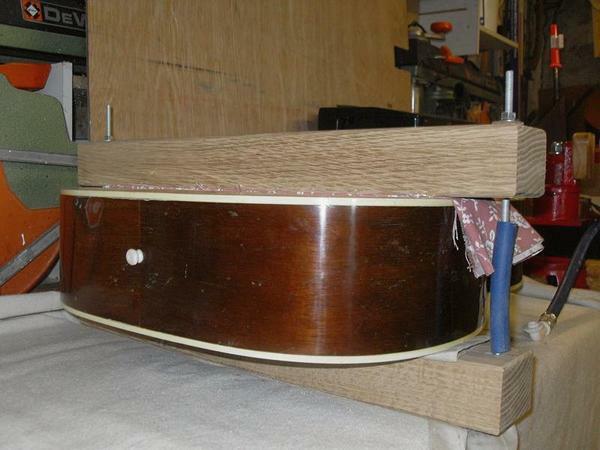 By reducing the bulge, it also lowers the bridge height in relation to the fingerboard so it also lowers the action and often saves the need for a neck reset so I would always reduce the belly bulge first. It's easy to do, costs nothing and has no effect on the sound. JLD claim that there's no loss of sound quality or projection using the bridge doctor but I can't see that having something physically pulling down the bridge plate area would have no effect on the sound. I've never tried one so I can't speak from experience. k1w1 : That's pretty impressive Colin. Do they stay flat over time ? fanfab4 : That's a great solution Colin . But can't the constant steam inside the guitar loosen braces or other areas where hide glue is . How long is the steam used and is it applied only on the part where the bulge is ? harmony collector UK : Laurie, all but one of the tops I've flattened so far have stayed flat. One of the very first ones I did came back up a bit but I think I tried to do it too quick and didn't leave it long enough to dry out. David - The steam's not constant and is only applied to the underside of the bulge. I just did Kent's old 1203 but the bulge wasn't too bad and I only had to steam it once for about five minutes. It would need far more than that to soften the glue holding the braces and kerfing. Then I left it for two days to dry out completely and it's now perfectly flat. A more severe bulge would need a slower gentler approach over few days, tightening the clamp no more than a millimeter or two a day. There'll be some photos on a new thread about the work on this guitar which should start on the site later today. Pete56 : It seems simple and cheap and it clearly works...but as a novice woodworker I feel a little daunted by the prospect of trying to make those gently and uniformly curved concave and convex cauls. Perhaps that's easier than it looks to me... Colin, maybe you could give us a lesson in how to make them ? 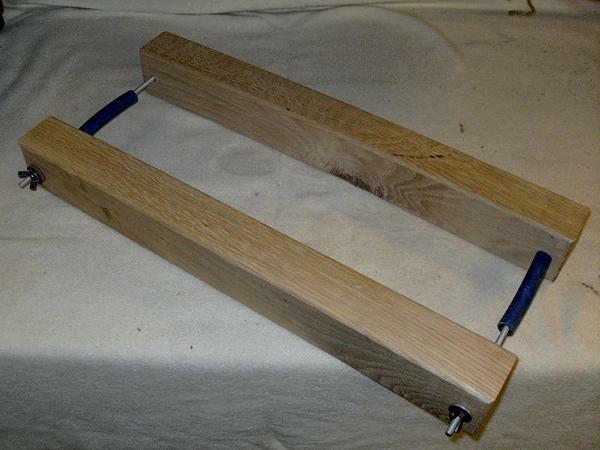 harmony collector UK : The clamp jaws were made from some 60mm square oak I had in the workshop from a previous job but any hardwood would do. I cut two pieces to around 550mm long and shaped the bottom jaw with an electric planer so it just fitted the back profile of a Sovereign - that radius seems to work OK on all the guitars I've done. Then I matched the top jaw which bears on the bulge to the same profile. I rounded the edges with a router and belt sanded them smooth. A hole goes right through the two at each end to take a length of threaded bar with a captive nut, recessed into the underside of the bottom jaw and a wing nut and washer on the top one. I slipped a bit of hose pipe over the middle of the threaded bar to prevent it scratching the guitar sides. I should fit some thick felt to the jaws but use a towel to protect the guitar surfaces. That's all there is to it really. The only thing to watch out for when you use the clamp is to make sure you stop tightening the nuts before the ends of the jaws touch the edge binding.